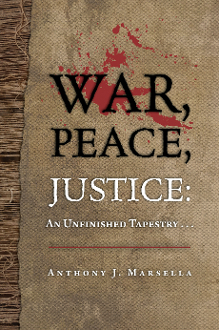 War, peace, and justice are the eternal threads of human history – each thread with distinct symbols, colors, and appeals, each thread with its defining events, forces, heroes, and villains. We speak of these threads too often as abstractions, but they are tangible threads – strands of substance – filling place, proportion, and consequence across time. The threads are inextricably linked, yet their connections are often not acknowledged. Together, they constitute an unfinished tapestry of the human condition, each thread simultaneously a cause, consequence, and challenge. The metaphor of the unfinished tapestry of human history in the title of this volume, and the absence of a loom for weaving threads, was gleaned from the writing of Edna St. Vincent Millay in her published collection of sonnets, Huntsman, What Quarry? Her imaginative words are honored in the opening pages of this volume because they capture the seamless nature of the torn and unfinished tapestry before us – the interwoven threads of war, peace, and justice, and the need to build looms and to weave tapestries free of torn edges and tattered views.